PInk, Green and Yellow Floral Theme Nursery Border Painting Technique. 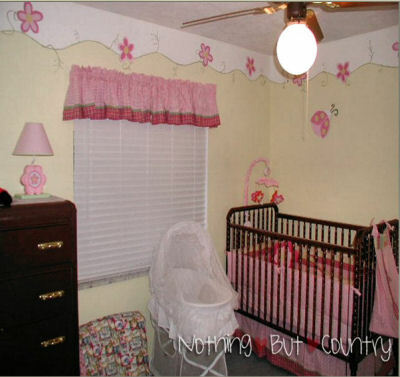 The pink and yellow nursery ideas are a reflection of Mary Beth's love of country home decor. The floral patterns, ladybugs and the overall color scheme of her baby's nursery that includes shades of pink and green, yellow and white with a touch of orange, are as fresh as a cool breeze on a spring day. And I know that everyone is excited to learn how she designed and painted the 3D nursery border! Were the walls in the nursery already painted pale yellow? This was the first room that we painted in our new home and as I look back I wonder what was I thinking when I painted them a crazy shade of red or would you call it fuchsia? Anyway, that paint color had to go! We learned our lesson here and wanted to choose a paint color that would grow with our baby girl so that we wouldn't have to re-paint the room over and over again. The first step was priming and then painting the room a light, pastel shade of yellow. It's a nice neutral shade and I believe that we can work with this color for many years. 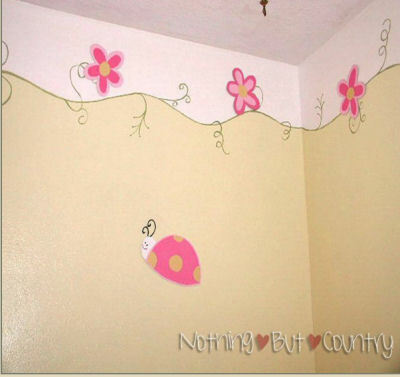 Can you share some instructions for how to paint a ladybug border with pretty pink flowers like yours? 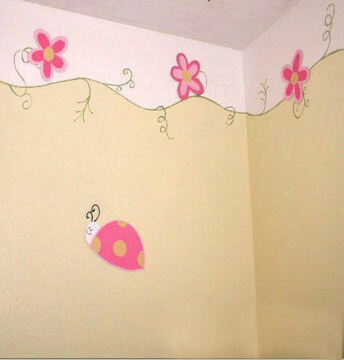 After our baby girl's pink ladybug nursery was painted, the next step was to paint a nice border at ceiling height. We used a 2 inch wide roller to paint a wave all the way around the room. In hindsight, it might have been a good idea to mark off how far down the wave border would dip as we went around but we didn't. We just eyeball-ed it because we wanted it to have an original look and not look so artificial and technical. After we had the bottom of the wave painted as a guide we filled in using white paint around the room. Using a liner brush and Plaid Acrylics paint color called Italian Sage, we painted a vine along the edge where the white border and the yellow of the walls meet. Rather than loading the paint into a container or onto a paint palette, I just put blob of sage paint on a styrofoam plate It was very lightweight and I found it easy or to work from than dipping the brush into a container and I didn't have to buy a palette. I used our baby bedding set as inspiration for the flower pattern. I drew a flower template similar to the ones on the baby's crib set with five petals on a piece of cardboard and cut it out. I traced outlines of the flowers on the back side of cheap, vinyl flooring squares that I bought at Home Depot. I didn't use the kind of flooring that already has it easy on it. This flooring is the cheap stuff that has a paper backing. After I had all of the flowers I needed drawn I cut them out using an exacto exacto knife. I primed the vinyl on the paper side and when the primer dried; I painted the flowers using 3 colors; light pink, dark pink and yellow paint. If you look closely to my photos. After all of the flower cut outs were painted, I placed the flowers on the border in a random fashio using permanent phone scrap booking stickers to lift the flowers away from the wall giving the border a three dimensional look. The very last, personalized touch was the addition of the pink ladybugs. They had nothing to do with the theme of the pink and yellow nursery design. I am just a HUGE ladybug fan and MOMMY wanted to add her own personal touch to the room so I created a pair of ladybugs using the same method to create and mount them on the walls as I used for the flowers. What is your favorite feature in the nursery? I love the yellow, pink and green nursery color scheme; it just made me feel so happy! Thanks so much to Mary Beth for sharing your green, pink and yellow nursery ideas and pictures with us! When you leave Unique Baby Gear Ideas, please visit Mary Beth's blog, Nothing but Country, to see more amazing baby girl nursery pictures with detailed tutorials that will walk you through the process of painting the border step by step including resources for the paints that she used. Could you please list the names and brand of the pink and yellow paint colors that were used in this project? Love the border at the top of the ceiling. Cutesey! Really, really cute! Thanks for sharing that neat technique for the 3D flowers.